When I ask my students to tell me what a director’s job is, most of them reply that the director is the head of the crew, or that he supervises all creative efforts. So before we delve into what the director’s main function is, let’s explore the other members of a simple, independent film production team. Let’s say you have a script, a budget, and a wonderful crew that is working on your project through all of the stages of production. There are at least four key crewmembers guiding the whole filmmaking process: the producer, the director of photography, the production designer, and the director. Let’s break down the first three crewmembers’ jobs. • The Producer is responsible for supporting the production process by taking care of contracts, food, equipment, and many other functions. • The Director of Photography (DP) is responsible for the visual aspects of the movie, a set of decisions regarding camera angles, lighting, etc. • The Production Designer (PD) oversees set construction, costume design, props, color choices, etc. So what does the director do? Can she ask the DP what kind of direction (images, back story, objectives) she should give to the actor on the set before shooting begins? Can she ask her buddy, the Producer, how to work with the actors? Can she ask the PD about any of this? Or, is there someone else on the set that the director can ask these kinds of questions? No. These issues are the director’s job to figure out. The director’s main function is to work with the actors by giving them instructions to help them craft a truthful performance. Often, inexperienced directors will waste time trying to control each step of the DP’s work, forgetting that the director’s main function and responsibility is to work with the actors. Most film schools do not give directors enough classes or training in this area, an area that I believe is of primary importance. Some film schools never even touch on how to direct actors and only study the technical aspects of direction. Of course these are important, but they are not the main function of a director. Many books about directing contain a lot of information on screenwriting, editing and cinematography, when not even a single page is devoted to working with actors. 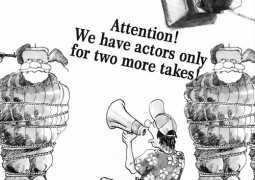 Thankfully, there are a few instructors around the world that teach workshops on the essentials of how to direct actors, and there are a few books that cover this as well. Of course, you can try to hide bad acting with VFX and sound effects. This is a common practice in low-grade films, and it is well known that the sound dictates about 50 percent of the audience’s perception of the movie. Sound and visual effects can greatly impress the audience, even without truthful acting. Smart editing, using editing styles like the Kuleshov effect and montage, can help to create an entertaining movie, even with bad acting. But if you remove the visual and sound effects from most of these movies, the film no longer has anything interesting to offer. 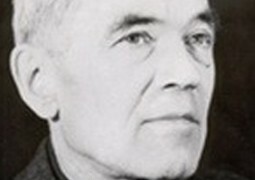 Lev Kuleshov (1899-1970), a prominent Russian director, was one of the first film theorists. He was a founder and leader of Soviet Editing Theory, which preceded the editing theory of Sergei Eisenstein (who was briefly a student of Kuleshov). For Kuleshov, the essence of cinema was editing, the juxtaposition of one shot with another. To illustrate this principle, he created the Kuleshov Experiment, which has subsequently become known as the Kuleshov Effect. for showing almost imperceptible expressions of hunger, grief, or lust in turn. The reality, of course, was that the same clip of the actor’s face was reused, and the effect was created entirely by superimposing it with other images. The expression of the actor did not change because Kuleshov used very same piece of film, but the audience’s perception was very different. Flashbacks in films are a great example of the Kuleshov effect at work. For instance, let’s take a scene with a character talking about his past experience of being a cop. If we incorporate flashbacks of dead bodies, for example, the audience will perceive that the character suffers from posttraumatic stress emotions, even if there was no acting at all. You can watch examples of the Kuleshov Effect on YouTube. 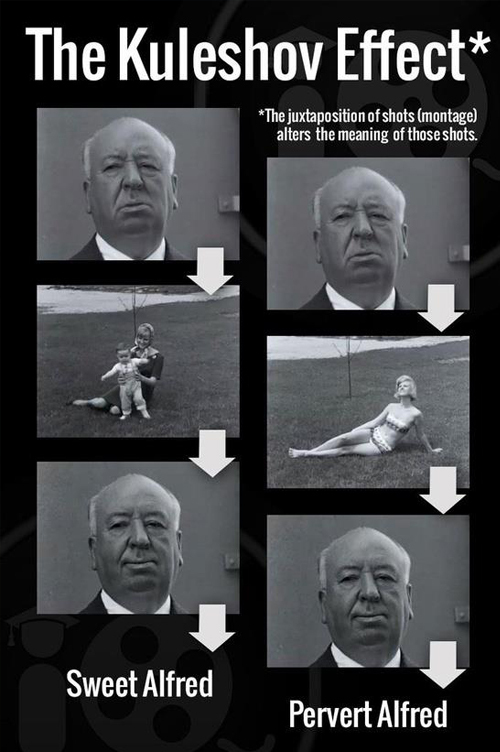 The Kuleshov Effect has been used in many films. The idea is that, by editing different things together, it is possible to create meanings, effects in the audience that didn’t delivered by actors at all. Another way how to hide bad acting/directing is by smart editing. Here you can understand the difference between theater and film. The theory of editing, developed by Sergei Eisenstein is still relevant. In the US, the montage is a technique in film editing in which a series of short shots are edited into a sequence to condense space, time, and information. The term has been used in various contexts. In Europe, the montage is the film editing itself. In France, the word “montage” simply denotes cutting. Eisenstein was a pioneer in the specific use of film editing. He and Kuleshov maintained that editing was the essence of the cinema. 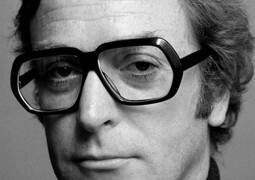 His articles and books (particularly Film Form and The Film Sense) explain the significance of editing in detail. Eisenstein believed that editing could be used for more than just clarifying a scene or moment through the linking of related images. 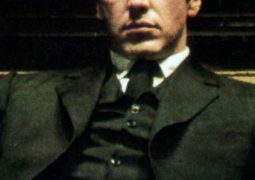 He felt that the “collision” of shots could be used to manipulate the emotions of the audience and create film metaphors. His idea of editing was that scenes could be derived from the juxtaposition of two independent shots, bringing an element of collage into film. He developed what he called “methods of editing” called Metric, Rhythmic, Tonal, Overtonal, and Intellectual. These five types of editing can be found in modern movies. Eisenstein’s writings and films have continued to have a major impact on filmmakers. One of first adoption of editing (montage) in the US was Sunset Blvd the American classic film by Bill Wilder. • Type one is the kind who works primarily with actors and is focused on directing actors. This type creates real masterpieces that audiences will watch over and over again. These directors can work successfully in film and/or theater. • Type two is the director who really doesn’t care about giving the actors good directions, and who is primarily focused on the story, editing, and VFX. These directors make movies to be seen just once. Often in today’s filmmaking world (but not always) we see directors become financially successful even though they have no idea how to direct actors. Interviews with Jack Nicholson, Morgan Freeman, Robert De Niro and others who have worked with this type of director prove that. This shows that financial success and professionalism are not necessarily associated with each other. In spite of this, remember that professional actors are very eager to work with professional directors. If you learn to direct at a high level, the actors will crave to work with you. So if you want to make memorable movies, the kind that will engage the audience so much that they will want to watch them again and again, you must become a type one director. The most memorable performances have been directed by type one directors such as Francis Coppola, Darren Aronofsky, Akira Kurosawa, Robert Zemeckis, Steven Spielberg. And note that these directors did not rely on or have many VFX and special effects in their movies. This does not mean that a director doesn’t have to know about editing, VFX and cinematography; on the contrary, they have to know these skills very well. But it is more important to know the art of directing actors, an art that has been developed by many great practitioners throughout world during last 100 years. The theater, alternatively, doesn’t have editing and visual effects. If the director is not able to work with the actors well, it is immediately evident. 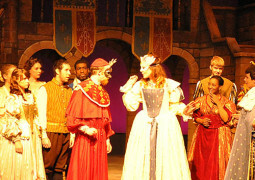 The audience will be indifferent if the performances are poor. Although an incompetent film director can hide his ineptness through sound and visual effects, a stage director must know the art of directing actors to be successful. Thus, the main function of a director in theater and/or films is to work with the actors in the development of a character and to give them good directions.